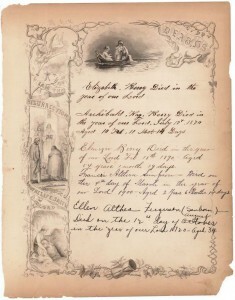 Bible record for the Ebenezer Berry family, 1835-1936. R. Stanton Avery Special Collections, NEHGS. Yesterday I wrote about substitute records that can be used to locate elusive modern vital records. These alternative records can be especially beneficial when an index to the civil vital records is unavailable. Using these alternatives, you can then contact the appropriate authority to provide a copy of the original vital record. Probate records. Probate records, such as wills and administrations, can provide the names of a deceased’s heirs and sometimes the date of death (or an approximation based on the date a will is probated). NEHGS maintains a large collection of New England and Atlantic Canada probate on microfilm. Additionally, several U.S. town and county probate collections are available digitally at FamilySearch.org or on microfilm at the Family History Library. Deeds. Sometimes deeds identify specific relationships between the grantor (seller) and the grantee (purchaser). This can be especially helpful in identifying the first name of a grantor’s spouse. Most deed records for the New England states are available on microfilm at NEHGS, while other U.S. land records are available digitally at FamilySearch.org or on microfilm at the Family History Library. Military records. From draft cards to pension records, these records often provide very specific information about a soldier’s birth, marriage, and death. In fact, pension records can even include pages that were torn from a family Bible. Some military records are available at fold3.com; Ancestry.com; and FamilySearch.org. Cemetery records (tombstones or burial records). Be sure to check with a local genealogical/historical society for cemetery transcriptions, as the stone may have been removed or damaged. Also, some national cemetery databases include: findagrave.com; billiongraves.com; and MooseRoots. Church records. Baptisms, confirmations, marriages, and funeral records may have been recorded with the church, and not registered on the local or state level. To locate a church record, you must first identify your ancestor’s religion and/or congregation. Some records are still maintained by the original church (or church archives), while others may have been microfilmed or published. NEHGS maintains a large collection of compiled church records from across the United States, and the Family History Library has some church records on microfilm. Bible records. Although rare to find, Bible records can be significantly helpful when available. To locate a Bible record specific to your ancestors, contact the local historical society, archive, or genealogical society associated with the family. NEHGS maintains a large collection of bible records in the Stanton Avery Special Collections. Published genealogies and local histories. Often unacceptable as proof for a lineage society, these published resources can at least provide an approximation of birth, marriage, and death. NEHGS has a collection of 30,000 published genealogies and 40,000 local histories. Also, several sites have digitized material, including the NEHGS Digital Library and Archive; Internet Archive; Google Books; and Family History Books. City directories. 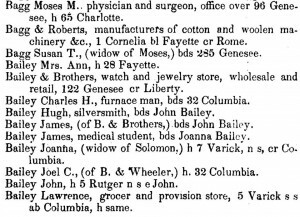 Like census records, city directories can be used to approximate a person’s date of death, as the person may disappear from the record altogether, or their spouse may be listed as a widow. Sometimes, if you’re lucky, the directory will identify a specific date of death. NEHGS maintains a large collection of city directories, as well as ancestry.com. 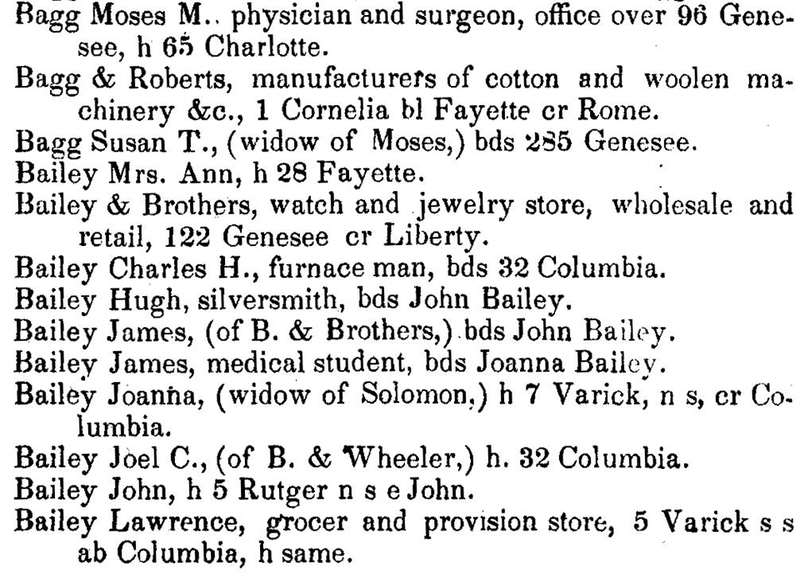 A page from the 1850-51 edition of the Utica City Directory. Again, these are just a few of the alternative records available. In fact, if you have a favorite alternative resource, please include the information in the comments below. Every suggestion helps! I have found the Grand Lodge of Mason Membership Cards. 1733-1990 a great site for finding male members of my family. Family Bible Records are actually NOT rare. In fact, many & many have been published in very very local, state-wide or regional paper-based “platforms”, i.e. old periodical series such as The Ridge Runners [upper South & Ozark migrations], if I may skew the word and concept backwards in time. Such a periodical might have a yearly index, but the Bible record within is often not indexed. Both original and published Bible records are all over the place, in out of the way attics now owned by the descendants of the out-laws or being sold on eBay, etc. And that’s the problem. There’s No One Place that systematically collects them. There’s no one single or joint or collaborative PROGRAM that has issued a Clarion Call to Send Us Your Family Bible Record (copy thereof). Yes, the Society announced its own BR collection program some time ago, and stories have regularly appeared in The Magazine to highlight such material as part of Special Collections, and to remind members (me too!) & whatever general reader happens to come across the plea to consider donating such items. But without a broad-based push, focusing on how ephemeral these are and yet how VITAL for the future just by being preserved in an open research environment. If the Society continues its New York focus, then a campaign to collect pre-1904 Bible records related to the Empire State would be appropriate ongoing effort. Ramp it up in collaboration with the many genealogical societies in the state, for instance. The not-unimportant-secondary issue then becomes access-as-information. But I’ll leave that up to IT and Head Librarian. Wonderful idea re collection and, of course, access. Local societies can do a great job of pulling old records out of attics in a gathering effort, if an effort gets them excited and they can later access the data. The most effective effort would encourage societies to cast a wider net beyond their immediate memberships. Societies or their members may also have copies of privately published books of Bible records and other information, which books were never sent to major repositories such as Salt Lake or Fort Wayne, and/or which were published in runs of few copies before the use of desktop computers. Some societies may have copies of Bible records that support their own lineage certificate programs (example, near where I live a local society has such a program, the data gathering for which has never seen the light of day, mostly for the practical reasons of access). As I recover from my shock over eBay above, perhaps local genealogical societies could be informed and involved to seek and acquire old Bibles, etc., in conjunction with the kind of Bible-gathering effort that you describe, if a centralized effort is not feasible. Rutgers University has a large collection of family Bible records. This collection has been useful in researching my family (Samuel Stout born 1779 and wife Letitia Opdycke born 1786). In addition to probate records, sometimes looking in county civil record databases can provide information on divorces, paternity suits, guardianships (although these are usually part of the probate court), and other lawsuits. You can find fascinating information on family & neighborhood dynamics within these records. In addition to membership rolls, etc, membership societies also may have additional resources that can provide genealogical information. I had great good luck researching the genealogy of some Salem, MA sea captains by looking through scrapbooks maintained by the Salem Marine Society. These scrapbooks contained newspaper articles with genealogical information and even handwritten notes in the margins of the scrapbooks. One of these notes identified the city where one sea captain died, a place that I had never seen mentioned before in connection with that individual. And they made fascinating reading as well! Also family correspondence can provide vital record information. My great grandfather’s sister saved copies of the drafts of her letters, many of which contained genealogical information. The letters referenced a family bible, but that family bible is nowhere to be found. But the letters themselves provided a birthdate for my great great great great grandfather and an exact date of death. Neither his birthdate nor his death date are found in any vital records that I have been able to see so far. I don’t know if a genealogical society would accept family correspondence as proof, but I was still thrilled to find the information. I have several family bibles. I scanned them and attached them to my family tree at Ancestry.com in an effort to share them with anyone who is interested. Many people have downloaded copies of these family bible pages from my tree. I also contributed copies to the collection at the DAR’s GRC (Genealogical Records Committee). The DAR GRC index is available for online searching by the public.